Here in this gorgeous tapestry "The Mill Pond" we see the work of artist Alexander Sheridan. Sheridan was born in Capetown, South Africa and he was inspired into art by his father's drawings of the highlands of Scotland. He and his family returned to Scotland, the later Southampton. He then travelled to India, Singapore and later to Dunedin, New Zealand. He returned to London and finally Ipswitch where he resides. Here the scene is of a gorgeous Georgian style town on the river with an afternoon light verging on dusk. 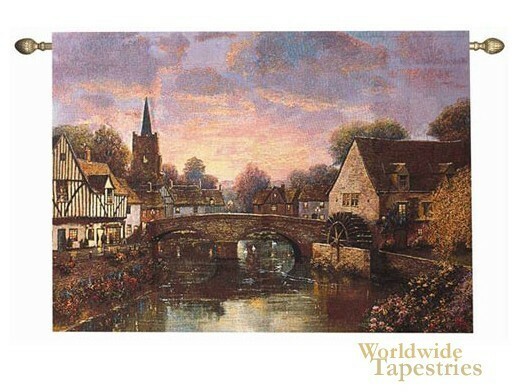 This cityscape tapestry "The Mill Pond" is backed with a lining and has a tunnel for ease of hanging. Note: Tapestry rods, where pictured, are not included in the price.